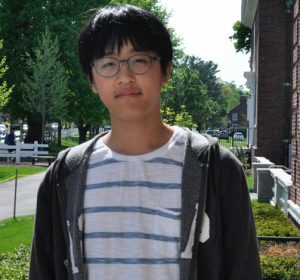 Qualifying among the country’s most competitive math students, Lawrence Kim ’21 represented Milton in the highly selective United States of America Junior Mathematics Olympiad (USAJMO). Lawrence qualified for the USAJMO with high scores in a series of math competitions. He then sat for the nine-hour USAJMO over a two-day period, where he competed against fewer than 250 other students from the United States and Canada. The test consisted of six questions, for which Lawrence had to present essay-style mathematical arguments, and required him to work in a testing room away from all electronics and outside influences. When he was younger, Lawrence would borrow his older sister’s math homework and solve the problems on his own. Math competitions help him challenge himself and feel empowered to take risks, he said. A handful of students scoring at the top levels of the Olympiad qualify for a summer math camp, from which an even smaller selection is chosen to represent the United States at the world level. Although he did not qualify this year, Lawrence intends to try again, and he has applied to summer math programs this year. Milton Academy previously was represented at the International Math Olympiad by Paul Valiant ’01, who competed at the world level three times.